While the educational success of Finland and many Asian countries has caused a stir in U.S. schools, our neighbor to the north deserves some attention as well. Canada turned heads with great results from the first PISA tests in 2000. In 2012, it continued its strong performance. The nation ranked 13th in math while the United States earned the 36th spot. In science, they were number 10 compared to our 28. They ranked number 7 in reading, while American students earned the 23rd position. Teaching schools in Canada are very competitive. Getting in requires a four-year degree and some outside teaching experience. This can come from internships or volunteering, but often comes from teaching abroad. Many Canadians aspiring to teach at home teach ESL internationally first. This gives them the necessary teaching credit plus an income with world experience. After living on the economy in a foreign country and teaching students who are completely un-Canadian, they return home with much more seasoning. Canadian teaching schools accept most of their entrants from the top 30 percent of undergraduates. Schools pay teachers better in Canada, too. Starting secondary teachers in Canada earn 85 percent of the GDP per capita, while their American counterparts earn only 72 percent. The gap continues throughout their careers. Throwing money at education is not always a fix, but better paying jobs are more desirable. In the States, we lose quality teaching candidates to more lucrative employment. In Canada, schools pay teachers more than many other employers pay professionals with similar educations. Teaching is a tough job. You have to sell it to potential applicants. Only eight percent of Aboriginal Canadians have a college degree while 23 percent of non-Aboriginals do. The Aboriginal population in Canada is growing almost six times as fast as the rest of the population. Canada knows it has an education gap between its native and non-native population, but it is working on it. The nation has adopted the Indigenous Education Protocol for Colleges and Institutes. Respect for the individual culture, language and history of Native Canadians is a priority. The movement strives to provide education in native tongues. Increasing the number of indigenous employees in education is also important. Acknowledging the growth of its native population, Canada is dedicated to helping them be powerful members of the community. Another major source of growth for the Canadian population is immigration. Schools provide resources for the entire family, not just the student. Parents learn English as a second language through the school community. Settlement organizations within each district assist with housing, jobs and other necessities for immigrants. The result is new families merging easily with Canadian culture and producing successful students. Raymond Théberge, Director General of the Council of Ministers of Education, Canada (CMEC), states that many second-generation immigrant students outperform students with deeper Canadian roots. As a country with two national languages, bilingual education is commonplace. Canada has adopted a European-style vocational education system that not only prepares students for jobs but also reduces the dropout rate. Ontario in particular recently launched its “Specialist High Skills Majors" program, which trains secondary and post-secondary students in fields such as aviation, health and transportation. Apprentices are granted $1000-2000 annually. Businesses receive a 10 percent tax cut on wages paid to their apprentices. The graduation rate in Ontario has risen from 69 percent in 2004 to 82 percent in 2013. Students stay engaged in school with vocational education and have tangible reasons to stay with it. Canada’s Student Success Strategy is another dropout prevention program. It provides one-on-one learning opportunities, develops in-demand courses of study and incorporates hands-on experiential learning. Schools assign special teachers whose sole jobs are to assist those at risk of dropping out. For students not on a university track, vocational training provides focus and a sense of self-worth. Canada has no centralized Ministry of Education. Rather, each of the 10 provinces and 3 territories has their own elected Minister of Education. They meet together as the CMEC but share no universal curriculum. They embrace the uniqueness of their own population and focus on its needs. They share ideas and enjoy a friendly competition. Within each territory or province, however, the weakest school is lifted up. They are never punished or denied resources. Rather, they utilize data from more successful schools and receive additional funding. Teachers do not feel pressed to conform to a national standard. They do what they know is best for their community. 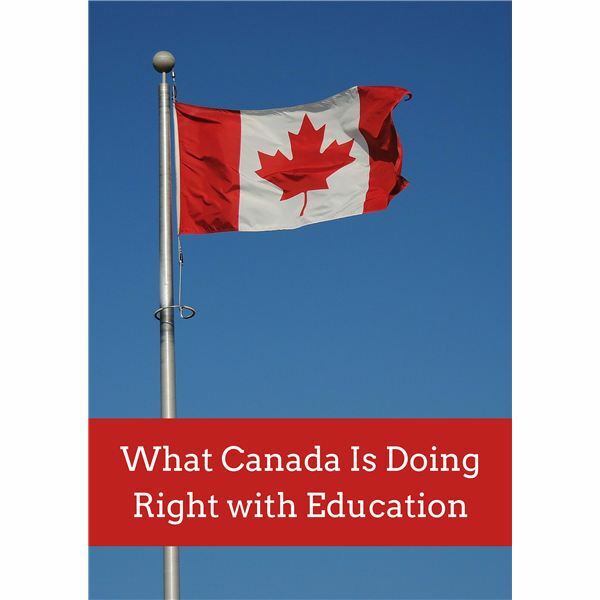 How is Canada excelling in education? By selecting and supporting the finest teachers, by capitalizing on its diversity and by avoiding a rigid structure.